Bab Al Bahr, Abu Dhabi. Book with Tropical Sky today. 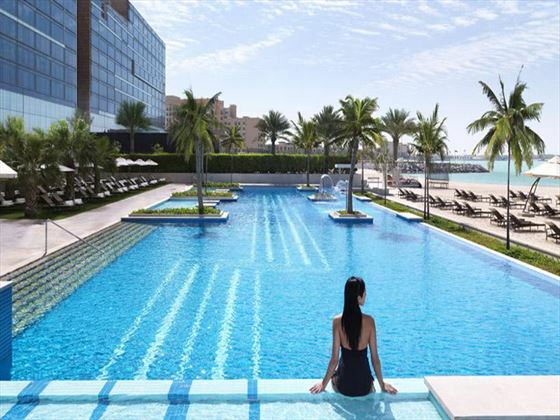 Located in the contemporary, vibrant and exciting city of Abu Dhabi, it'll come as no surprise that Fairmont Bab Al Bahr is just as luxurious and extraordinary. Nestled in the city's gateway, it's the perfect place to indulge should you fancy exploring the city and all it has to offer. Overlooking the Sheikh Zayed Grand Mosque, you'll feel like you're in the heart of the city, yet still be treated to a tranquil and secluded stay. All of the rooms here are spacious and modern, with incredible views from the floor-to-ceiling windows, and contemporary decor that feels very luxurious indeed. With it's own private beaches and sprawling swimming pool, there's plenty of space to soak up the sun and relax in between exploring the city's old souks and impressive attractions. 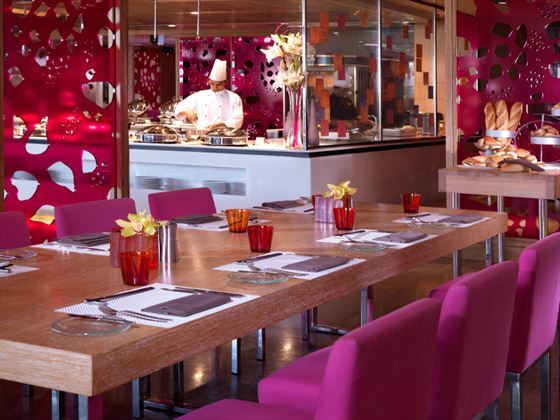 Meanwhile, the resort's restaurants offer stylish spaces to dine on sumptuous cuisine and truy a few divine cocktails. Treat yourself to a gourmet burger at Poolside, or enjoy an authentic Lebanese experience at Maison Beirut. 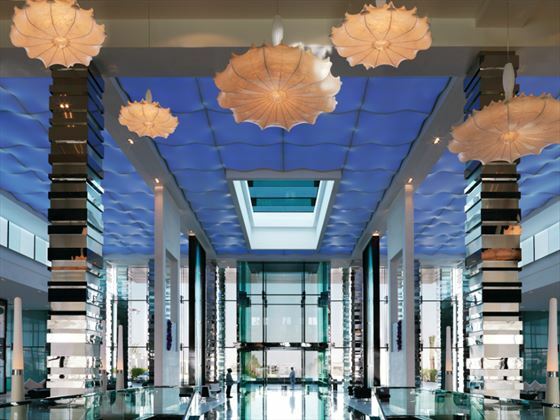 Fairmont Bab Al Bahr takes you on a true culinary journey. 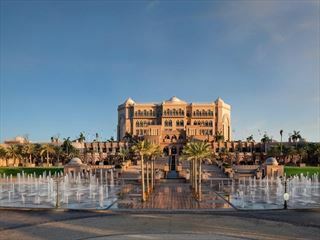 You'll find this luxurious resort at the gateway of Abu Dhabi, offering close proximity to the city's old souks, amazing nearby desert, and out-of-this-world attractions. Overlooking the Grand Mosque, you'll feel in the thick of this extraordinary metropolis. Fairmont Room - Contemporary 45sqm rooms featuring the standard amenities. 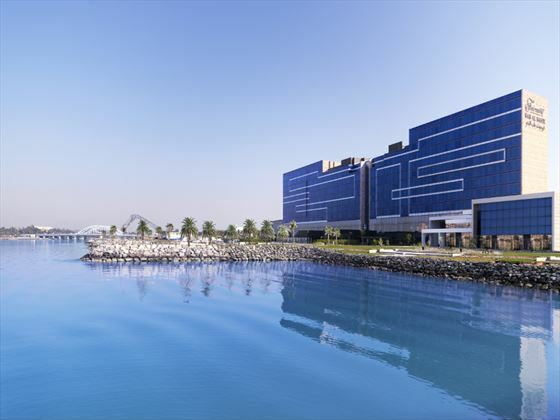 Fairmont View Room - Stylish 45sqm rooms offering gorgeous views of the Abu Dhabi creek. 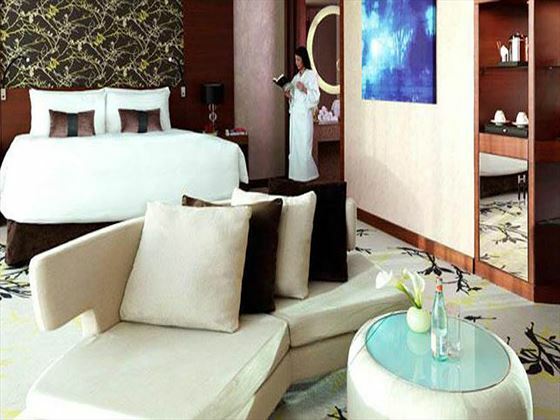 Deluxe King Room - Spacious 60sqm rooms with a large living area perfect for relaxing. Deluxe King View Room - With the same amenities as before, with the added luxury of commanding Sheikh Zayed Grand Mosque views. 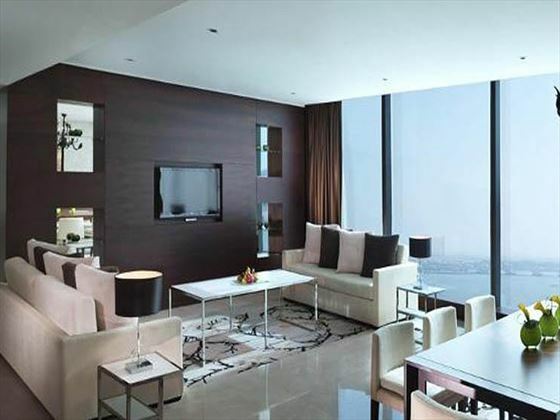 One Bedroom Suite - Elegant 93sqm suites, featuring a separate lounge with sofas and a coffee table. 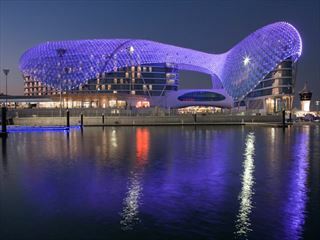 One Bedroom View Suite - Chic 93sqm suites with a separate spacious living room that looks out onto the Abu Dhabi Creek. 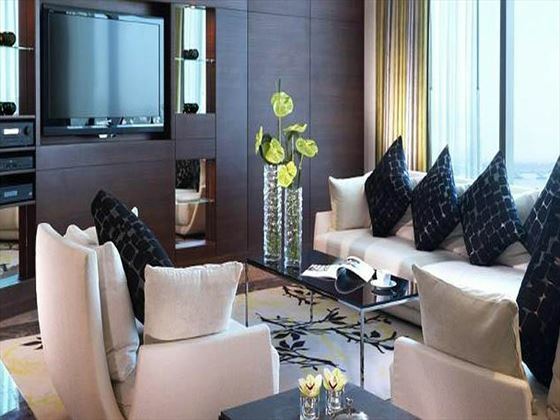 Presidential Suite - Sleek 215sqm suites boasting modern decor, featuring a large living room, two bedrooms, two bathrooms, sensational views of Abu Dhabi Creek, and access to the Fairmont Gold* services - including an on-call butler service. Royal Suite - With 265sqm of space and chic, contemporary decor, the Royal Suite boasts luxurious amenities, including two bedrooms and bathrooms, a spacious lounge, a private dining area, and access to Fairmont Gold* lounge and its facilities, including on-call butler service. *Fairmont Gold - A luxurious club with its own extravagant lounge on the 7th floor of the hotel, and plenty of wonderful amenities. These include arranging dinner reservations, limousine transportation, and on-call butler service. The lounge has brilliant privileges including complimentary cocktail canapes, hot beverages, WiFi access, daily breakfast, afternoon tea, and sundowners. 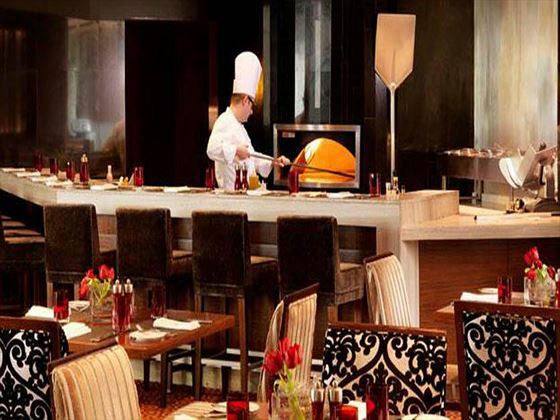 Cuiscene - A casual yet elegant all-day dining destination, where culinary artistry is performed at five cooking stations positioned across the restaurant. Guests savour bountiful international offerings from Europe, Asia and the Middle East, highlighting a different seasonal theme each month. Opening times: Saturday - Thursday 6.30am-10.30am, 12pm-3pm and 7pm-11pm. Friday 6.30am-10.30am, 12pm-4pm and 7pm-11pm. Frankie’s Italian Restaurant & Bar - With this collaboration between famed horse jockey Frankie Dettori and Michelin-star chef Marco Pierre White, guests can enjoy authentic Italian cuisine in a casual setting. Opening times: Saturday - Thursday 12pm-3pm, 6pm-1am with bar service 12pm-1am. Friday 12pm-4pm for Friday Brunch, 7pm-1am and bar service 12pm-1am. Marco Pierre White Steakhouse & Grill - Award-winning Marco Pierre White grings innovative grill cuisine and classic English fare to Abu Dhabi for the first time. Opening times: 6pm-12am. Sport's Cafe - A trendy sport's bar with leather chairs and wooden decor adding a contemporary vibe. Catch every sport playing on the big screens as you enjoy hearty food including huge sandwiches, chile con carne nachos and fish and chips. Opening times: Saturday - Thursday 4pm-2am, Friday 12pm-2am. Cafe Sushi - A laidback Japanese restaurant serving deliciously fresh sushi and sashimi, as well as tasty Japanese favourites such as black cod fish and miso marinade. Opening times: 12pm-4pm, 7pm-11pm. Maison Beirut - A sophisticated and stylish Lebanese restaurant, with a spacious outdoor terrace and live entertainment. Opening times: Saturday-Wednesday 12pm-1am, Thursday 12pm-3.30am, Friday 12pm-1am. Buffet breakfast served at CuiScene Restaurant including free flow of tea, coffee, water and selected non-alcoholic beverages. Set menu lunch served at Pool Bar or Frankie’s Restaurant with selection of 3 starters, main course and desserts inclusive of free flow of selected non-alcoholic beverages, water, tea, coffee and selected wine, beer and spirits: vodka, whisky, rum and gin. Buffet dinner served at CuiScene Restaurant including free flow of non-alcoholic beverages, water, tea, coffee and selected wine, beer and spirits: vodka, whisky, rum and gin. Pool Bar will be serving free flow of non-alcoholic beverages, tea, coffee, water and selected wine, beer and spirits: vodka, whisky, rum and gin from 10am to 7pm.